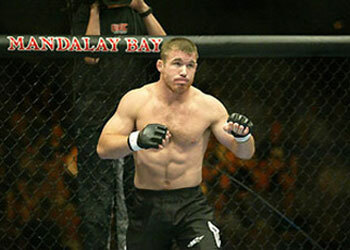 IF you ask UFC light heavyweight Stephen Bonnar, the former welterweight king Matt Hughes will officially hang up his gloves after he settles his differences with Matt Serra tonight at UFC 98. “I’ve heard it from Matt Hughes’ mouth that this is going to be his last fight,” Bonnar said during an appearance on ESPN.com’s MMA Live. Following nearly a year-long layoff, Hughes is ready to get back in the Octagon one last time before calling it quits. During a dominant run atop the UFC’s welterweight division, Hughes successfully defended his title 7 times with wins over BJ Penn, Georges St-Pierre and MMA pioneer Royce Gracie. Following his UFC 85 loss to Thiago Alves, Hughes did state that he had “one more fight in me.” However leading up to today’s showdown, Hughes has been mum on any retirement talks. It’ll be hard to believe that a competitor like Hughes would be willingly step away from the sport if he loses to Serra, but if he were to lose to such a heavy underdog, there be no better way of accepting that it is time to move on.